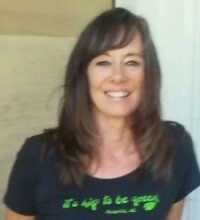 It's Hip To Be Green® Women's Organic Cotton T-shirt Women's Organic Cotton T-shirt. t's Hip To Be Green ® T-shirts! Our Ethical Clothing 100% Organic Cotton T-shirt line is now available for purchase. We are so excited from the wonderful feedback we are getting from customers. They love the feel, softness, chic design and lower neck line. They truly are luxury Ethical T-shirts. Produced in the USA and sustainably produced with high ethical standards, and printed with low impact dyes, our t-shirts walk the talk on Being Green! Our sustanable clothing It's Hip To Be Green® T-shirts make a wonderful gift to show your support on the Green movement. Be Green, Live Green isn't just a fad, it is a not so new trend that is growing. Show your support, wear Green.